Kate Grace picked another great time to set a new personal best. In the women’s 800m semifinal, she had to go up against the likes of gold medal favorite Caster Semenya of South Africa, Great Britain’s Lynsey Sharp, and Belarus’ Marina Arzamasova – all women who entered the event with faster times than Grace. Only the top 2 automatically advanced to Saturday’s final, and then the next two fastest times across all three semifinals would fill in those final slots. Fortunately for Grace, she was in heat 3 and had an idea of what time she needed to run if she did not go top 2 – 1:59.41. Once the gun went off, Grace followed her traditional race plan – take her time and wait until the final 200m before making her move on the field. She went through the 400m in around 58 seconds in fifth place. She made her move at the 200m mark, following Semenya and stuck behind the top three of Semenya, Azramasova, and Sharp going into the final stretch. Azramasova provided an opening on the inside rail which Grace charged through, finishing third in the heat behind Semenya and Sharp. Her time of 1:58.79 is not only a new personal best but also the fastest non-auto time, allowing her to qualify for Saturday’s night final. It was still funny to watch her learn from the NBC announcer that she had qualified for the final (shown above). 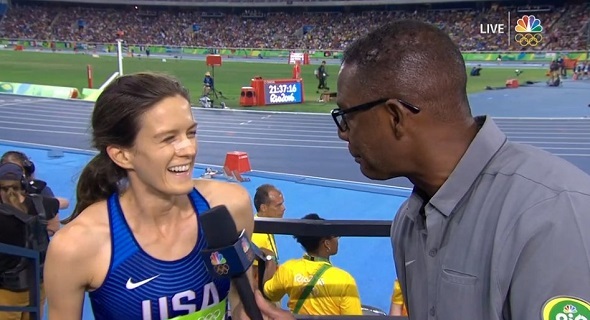 She will be the only American in the 800m final and the only remaining HepsNation athlete competing in the track & field competition. This entry was posted on Thursday, August 18th, 2016 at 8:53 pm. It is filed under Olympics, Spotlight. You can follow any responses to this entry through the RSS 2.0 feed.